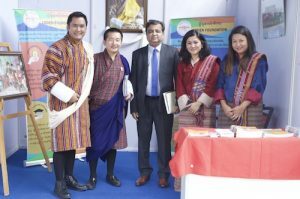 The two-day CSO Fair 2017 which was organized to commemorate the 6th Royal Wedding Anniversary concluded yesterday evening. The event that was inaugurated by our most dynamic Lyonchen Dasho Tshering Tobgay began with prayer offerings to His Majesty the King and the our most beloved Gyeltsuen. Venerable Tshoki Lopen of Zhung Dratshang, Hon’ble Chief Justice of Bhutan, Agriculture Minister, Chairman of Royal Privy Council and representatives from various national and international agencies took part in the inaugural programme. The event was aimed at showcasing a wide range of humanitarian services provided by different CSOs and to foster collaboration, coordination and consolidation between CSOs and the relevant stakeholders. A total of 47 registered CSOs around the took part in the event.